Looking for a new job is hard, but writing your resume doesn’t have to be. You’ve dusted off your resume and you’re starting to realize that it’s been a while since you looked this thing over. If you have that realization, don’t send your resume out as is. Whether you’re looking to take the next step in your career path or find a job that will promote your professional development, chances are there’s something you can improve before sending your resume to hiring managers. There are a lot of resources out there about resume writing, and everyone seems to have a different idea of what works and what doesn’t. With our complete guide to resume writing, you’ll never have to read another ‘How-To’ blog about the subject again. The first step to writing up your resume is to understand the purpose your resume is going to serve in your job hunt. Think of your resume as your 'best-of' career moments. You're using it to highlight the best work from each of your previous jobs and your skills. The purpose of a resume is to provide a high-level overview of your skills, career accomplishments, and work history. A resume isn’t a laundry list of your previous jobs, it’s your highlight reel. The best way to work through what to include in your resume is to start at the top and work your way down. This resume writing guide will only focus on the things you absolutely need to include in your resume. Remember, a direct and uncluttered approach to resume writing is the best approach. The header of your resume is your first chance to make a big impression. This is likely the first thing and hiring manager will look at when reading over your resume, which makes it the most valuable piece of real-estate on the whole document. Your resume header should include your name, your most current title, and your contact information. 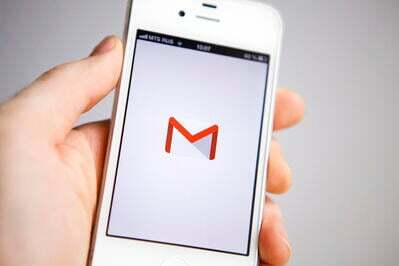 This makes it easy for recruiters and potential employers to get in touch with you. If you work in a field where you would be expected to have an online portfolio of your work (writer, graphic designer, videographer, etc. ), you should include a link to your portfolio in this section. Tip: Applying for a job out of state? Simply put “Relocating to desired city” in place of your current city and state. You don’t need to include your personal home address in your contact section. Your future employer doesn’t have any reason to know exactly where you live. After your contact information, your personal summary, also known as your resume summary, should be next. 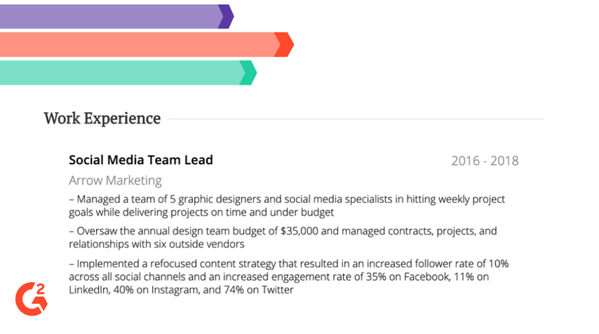 This section of your resume is a bite-sized overview of who you are as a professional. You don’t need a resume objective if you plan on using a personal summary. Having both on your resume will take up space and can seem redundant. Your resume summary should be written in the first person and no more than a paragraph long. A hiring manager isn’t going to read through more than a couple short sentences in this section, so you want to pack a lot of punch into a small section. This example is both personable and professional. You get a little bit of personality from the writer while knowing exactly who they are, what they do, and why they love doing it. Your skills and certifications section is a little more flexible than other sections of your resume. It doesn’t matter if you list it before or after your work experience. Ultimately that comes down to personal preference. What should you list under skills and certifications? You can skip including that you’re cooperative, a team-player, or a good listener on your skills section. Employers expect you to be all of those things and more. This is where you need to set yourself apart from other people applying for the job by focusing on tangible, hard skills. Your skills and certifications section should be a quick, bullet point list. You do not need to dive into any details here. Just list them out. This section of your resume will make up the bulk of your resume. This is where hiring managers are going to spend the most time looking, so you want to make sure you get this part right. A common mistake people make when writing their resume is listing every job they’ve ever had. Your resume is not a legal binding document. You are allowed to pick and choose which jobs you include. Did you have a job that you hated and your boss was awful to you? Unless it’s the perfect job to include on your resume, you can skip it! If you received a promotion or any notable awards in any of your previous positions, this is the section you would include those things. If you have been promoted in a previous position, you should focus your work summary on the job details for your most current position. A hiring manager wants to know what you worked on most recently at any company, not what you did three years ago. Each of these examples includes an action verb, quantifiable data, and gets directly to the point of the impact made in that position. The biggest mistake people make on their resume is putting their education at the top of their resume. Unless you’re currently in college or have just graduated, your education section should be at the very bottom of your resume. You don’t need to include your GPA on your resume, especially if you’re more than a year out of college. There are some exceptions to the rule, but unless you attended a prestigious university or have a Masters or Doctorate level degree, the education section matters less and less as you advance in your career. This section is important to show hiring managers that you attended school and meet their basic education requirements but that’s it. Don’t feel pressured to add fluff to this section of your resume. Keep it simple! Now that you know what you should include in your resume, it’s time to decide on the best format for your resume. There are three main types of resumes that you can choose from when crafting the perfect resume. The reserve-chronological resume is probably the one you're most familiar with seeing. It lists your work experience from most recent to least recent. This resume is perfect if you’ve been in the same field your entire career and have a linear career path. You should avoid using this resume if you have gaps in your work experience or if you’ve switched career paths. There are better options listed below for anyone with a less linear career experience. The functional resume focuses more on your skills and less on your career experience. This resume is perfect for those who have jumped around in their career or taken a significant time off from working and are looking to reenter the workforce. 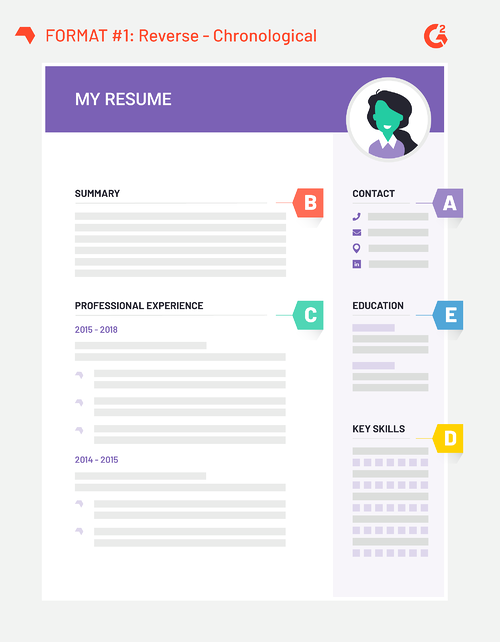 The functional resume will allow you to highlight the best parts of your professional experience without having to explain gaps in your work experience or frequent career jumps. 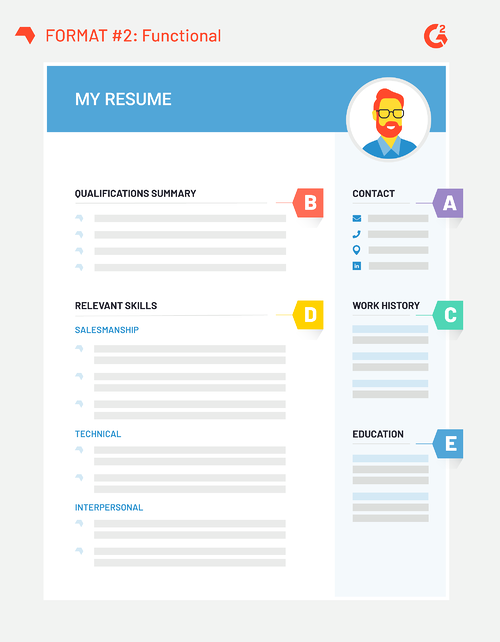 If neither of the above resume styles seem to suit your needs, the combination resume might be perfect for you. This resume format spends the first half covering your skills and qualifications, while using the second half to highlight your most relevant career experience. You shouldn’t use this resume if you’re an entry level candidate because you likely won’t have the necessary experience or skills to fill the entire resume. This is for more experienced candidates who are looking to move deeper into their career. Along with the technical aspect of actually writing your resume comes the unspoken rules that recruiters and hiring managers expect jobseekers to already know. 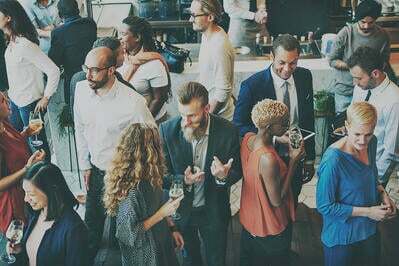 These quick tips will help you edge out the competition and stand out from a crowd of qualified candidates. Do yourself a favor and spend ten minutes making adjustments to your resume to fit the job you’re applying to before you send it out. It could mean the difference between a first round interview and your application ending up in the trash. This means you should be doing your keyword search on the job you’re applying for and finding what these programs are looking for when they scan resumes. You should be packing your resume full of relevant keywords (where it’s appropriate) to help increase your chances of having your resume screened positively by an ATS. 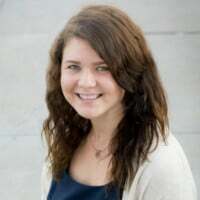 A survey conducted by Careerbuilder found that 75 percent of human resource managers (those who typically review resumes before passing on to a hiring manager) have caught a lie on a resume. If you get caught in a lie by an HR manager you can expect your resume to get tossed right in the trash. Getting a job is already hard enough without adding the complication of keeping track of little white lies and fibs you’ve told on your resume and during the interview process. Just don’t do it. The great debate around whether or not you really need a cover letter may be waging on, but 1 in 10 hiring managers won’t bother reading your resume without one according to that same Careerbuilder survey. You may like those odds, but if you want to maximize your chances of having your resume read then you should include a cover letter with your resume. Unless you’re twenty years into your career or applying for a C-Suite level job, you need to keep your resume to one page. According to Careerbuilder, a resume that's longer than two pages is a deal-breaker for 17 percent of hiring managers. That same survey from Careerbuilder mentions that 2 in 5 hiring managers spend less than a minute looking at a resume, and 1 in 4 spend less than 30 seconds. That means you don’t need more than a page on your resume because the hiring manager isn’t going to read it. 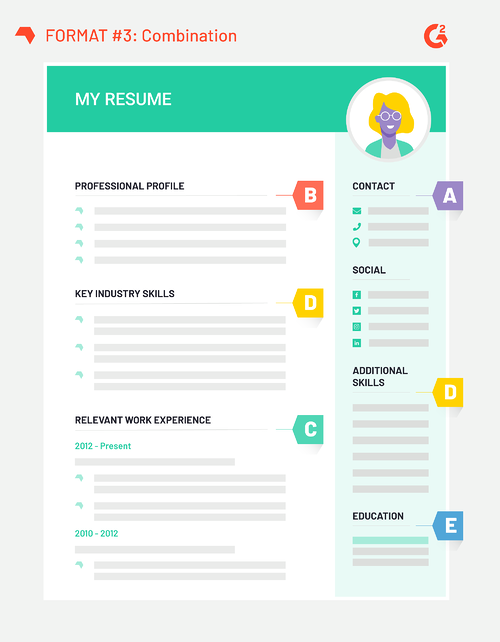 Save yourself the time and trouble – keep your resume to a single page. While writing a killer resume won’t land you your dream job, it’s the most important tool you have to grab the attention of a hiring manager. Spend the time crafting the perfect resume that shows potential employers why you’re the best fit for the job. Before you apply for that job, learn how to write a cover letter that pairs perfectly with your new resume.